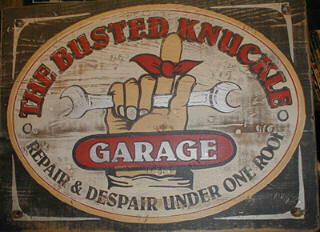 The June meeting was held at Jack Putnam's garage near Bluffton. Bob Torbet led the meeting with 15 members in attendance and 5 guests. Dave Benny reported on the balance in the club's treasury. This does not include money from the upcoming Jamboree. That money is being kept in a separate account by Jim Cook. We have been offered money to put 5 cars in the Forest, Ohio Parade. No one seems interested. Melvin Gierhart, Sue Cook, and Bob Torbet presented their materials to the group about the tour. The members OK'd a quilt raffle during the tour by next year's host club. The winner of the raffle will be announced at the Sunday night banquet. Also, Saturday night at the hotel is comedy night in the lounge. 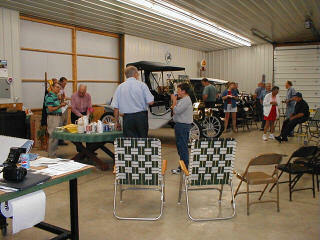 The meeting was closed and the group was shown the completed 1910 roadster. Richard Briggs was present to tell the members about the car. 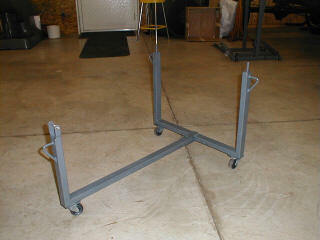 Bob Torbet showed a powder coated wheel that he has been working on. The July meeting was an informal picnic at Bob Torbet's house in Lima, Ohio. We finally got a good look at Bob's project car. It looks mighty good!! Wanted: Good 1930 Ohio license plates. Also need a Model A crank. This sign was found at an antique store in Sunbury, Ohio during a recent T trip. 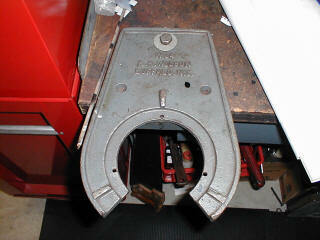 This is a picture of the K R Wilson fixture that is used to rebuild the rear axle assembly on all Model T cars. It seems like such a simple piece of metal. All of the holes and dimples are in just the right places. 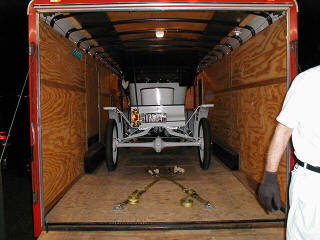 After many hours of loving labor by Bill Sieberg and Leroy VanAllen, the 1910 Roadster is ready for the road. The car is owned by Richard Briggs and was inspired by Dr. Shanabrook's car that was featured on the cover of Model T Times. Richard took the time to let us all in on a few of the car's facts. 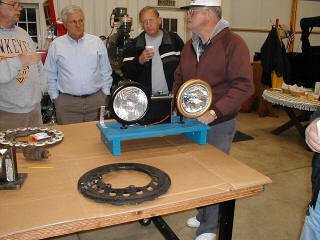 The cas was assembled from parts that have been collected at swap meets by Richard over the last 30 years. Back in the 1970's an Amish gentleman in Pennsylvania fabricated the body. The tires have been left black for contrast. 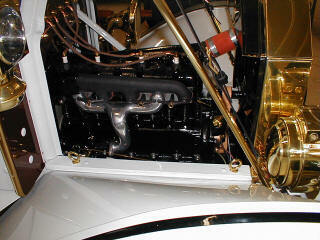 The engine compartment features an engine with open valves and an aluminum gooseneck intake manifold. We didn't notice any excessive leaking at the meeting; so, the oil return holes in the valve cavities must be working. 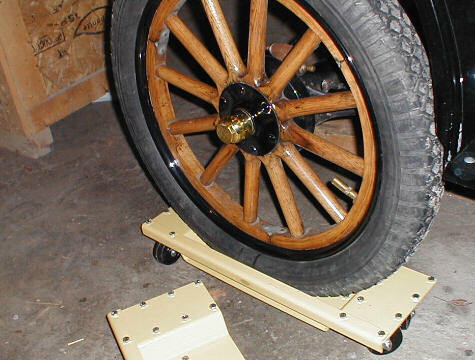 Bill has tried to keep the car as accurate as possible without spending too much extra time and money on a drivable show car. Richard should be very happy with the results. This picture of the interior points out one of Bill's other great talents. He is also a violin maker. Notice the deep wood tones on the firewall and the steering wheel. The combination of rich wood grains, black leather, polished brass, sparkling clean glass, assorted jet black castings and a white rubber mat make this car a beauty to behold. The untrained eye will never be able to distinguish this car from a restored original. Once again, Great work Bill! Most of the arrangements have been made and the reservations for this years Jamboree are flowing in. So far we have over 75 cars and more are expected. The tours are mapped out with Saturday going to Grand Rapids and Sunday going to New Bremen. If you have agreed to take part in the running of the Jamboree, please be at the August meeting to receive your assignment. The routes will be on display with all of the stops highlighted.